Evan was in need of an emergency plumbing service!! He found his drain lines clogged and kitchen faucet leaking. Evan was overwhelmed, for he was eagerly awaiting his family to join him for the holidays. Evan was requiring professional help to fix the problem immediately, but it was hard to get a plumber within his locality. Well, this is not just the case with Evan. Many customers are facing the challenge of reaching out to a good neighborhood plumber. Now, looking from the plumber side of the equation, if you are a plumbing service provider in the same locality, wouldn’t you want Evan to reach you? The best way is to build your presence in this mobile-app driven world. Yes, consider creating your own app as a viable option to have an edge over your competitors. You need not think it is gonna be harder or cost you bigger. Cogzidel is launching Uber for Plumbing services. The Uber app is fully customizable and therefore, you can change the features to suit your specific business needs. The app is efficiently built to enable your customers reach your plumbers quickly and the plumbers to respond to them instantly. 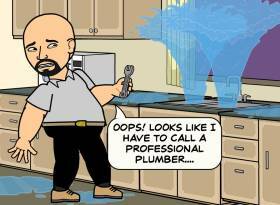 So, if you want to run your plumbing business efficiently and profitably, get our Uber for Plumbing immediately!! The App is available in two versions, the Customer app and the Plumber app. Both the version is compatible with Android and iOS operating system.